Weren’t buying into the hypebeasting of the Motorola X Phone, the company’s ultra-secret, next big smartphone? Does an official job posting for a position as the Senior Director Product Management for the phone make you a believer? The posting went up last night and includes the name and everything, just peek at a piece of the job description above. Nothing specific is mentioned about the phone, but that shouldn’t surprise anyone. The job listing itself looks like it could meet the needs of any product manager. The key here, is the fact that it actually mentions the “X-Phone,” something many believed to be nothing but a myth. The last wild rumor we reported on talked of a multi-carrier launch, also on Google Play, with unlockable bootloaders and a price that you won’t be able to pass on. I think it’s safe to say that the phone is real, we just don’t know if any of the other parts of the story are. 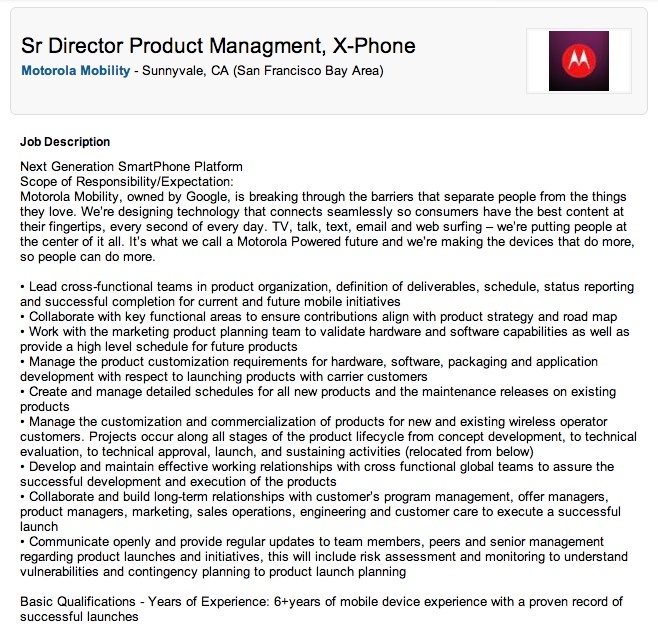 Update: Motorola has pulled the X-Phone job listing from LinkedIN. It’s still available in the jobs section of the Moto careers site (here), though. Not sure what to think. Were they trolling us? Did someone screw up?